This is my favorite boutique in Nashville. Every time I visit, I leave with something. They always carry a great mix of high and low pieces from brands like Ganni, Agolde, Schutz, and Z Supply. I love getting gifts at White’s Mercantile. They have the best selection of Nashville and Southern themed things for your kitchen, wardrobe, baby, dog, and more – without any of the kitsch. Every time I see The Truck, I always get a boutique to take home. I love their cheery selection of unique blooms! The coolest little vintage shop filled to the brim with great finds like old band tees, turquoise jewelry, and home curiosities. I love the facade of the store so much, I had to do a photo shoot there. Walking into Hero makes me feel like I’m transported into a modern country stars closet. They carry amazing pieces with a boho glam feel, that are just shy of too over-the-top for your average layperson. Get a custom pair of jeans made at this auto body shop turned denim atelier. See the rest of my outfit post from Imogene + Willie here. This amazing east-Nashville based plant shop just opened their second iteration inside the new Madewell store. The service of their staff is incredible and I have acquired quite a few green friends from them. 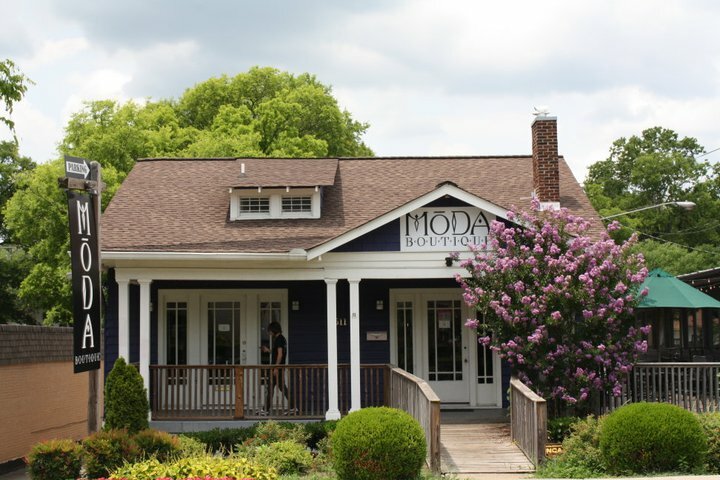 MODA is an awesome boutique with a great selection of everything from undergarments to overcoats. They carry well-reputed cool-girl brands like Splendid, Scotch & Soda, Rag & Bone, and Amanda Uprichard. The patio at bartaco is packed every warm spring, summer, and fall evening with people enjoying some of their great tacos and margaritas. Five Daughers is considered a Nashville staple, and their 12 South location does not disappoint. Come hungry and hankering for something sweet! You can enjoy your treats outside on their lovely patio on a nice day. You’ve probably seen their teas being served at restaurants all over town, and with good reason. Firepot is THE tea bar of Nashville, with an amazing selection of their own branded teas and tea lattes inside the cutest Moroccan-esque café. The cutest juicery specializing in açai bowls. I love coming here after a workout class down the street and grabbing a little treat. This Mexican gourmet popsicle shop has the most unique treat flavors that change daily – think avocado, cantaloupe, and Nutella. They make a great refreshing treat on sunny day walks down the street! Amongst the hustle & bustle of 12 South lies Josephine, a calm and quiet restaurant with dark and chic décor and high-end New American offerings. This classic Nashville coffee outpost is, like many other shops on the street, housed inside a cute old converted cottage. Taylor Swift has been spotted enjoying a coffee or two here. This is my personal favorite – just a simple and beautiful bright blue & white vertical striped brick wall on the corner of the Reese Witherspoon-owned boutique. Throngs of tourists line up for this iteration of the famous Nashville mural. It’s right across the alleyway from the Draper James mural, so you can hit two birds with one stone. This new mural on the side of the new Madewell store features an abstract tableau of bright figures frolicking in their signature denim. A minimalist black & white type that tells it like it is. A very Nashville take on politics, with two painted vinyl records interlocking behind a boho font. My favorite Pilates studio in Nashville for the great instructors and proximity to everything else in the neighborhood! I love walking up & down the street before or after a class. As the name suggests, this studio specializes in hot yoga. Their studio and amenities are all brand new! Besides having a shop in a cute cottage with all their latest activewear available, the 12 South Outdoor Voices also hosts workout events and classes around town, some of which are free! Click here for the upcoming events calendar. There is a small nursery next door to Frothy Monkey that sometimes carries seasonal delights. It isn’t always open, but when it is, you can expect to see a great selection of flowers in spring/summer, pumpkins in fall, and Christmas trees in December. This is a great park at the edge of the 12 South shopping strip with a few trails and playgrounds, and you’ll always see lots of strollers and dogs being walked around. Check out the bright yellow antebellum mansion on the property (nicknamed “Sunnyside”).